Be creative and express your artistic side and make a collage, a painting or Chanukah cards for the children of ALEH. ALEH is Israel’s largest organisation caring for people with disabilities. It is changing the lives of over 700 Israeli children and young people with severe physical and cognitive disabilities and gives hope to the children and their families. ALEH provides state-of-the-art medical, educational and rehabilitative care, and offers a framework for life – from infancy through adulthood. As a result of ALEH’s work the children are developing far beyond the boundaries of their initial prognosis, and are able to live full lives: attend school; participate in vocational training programs; enjoy swimming at the beach and tour the countryside. ALEH offers a wide range of services and community engagement schemes around the world, so everyone can get involved and make a difference! 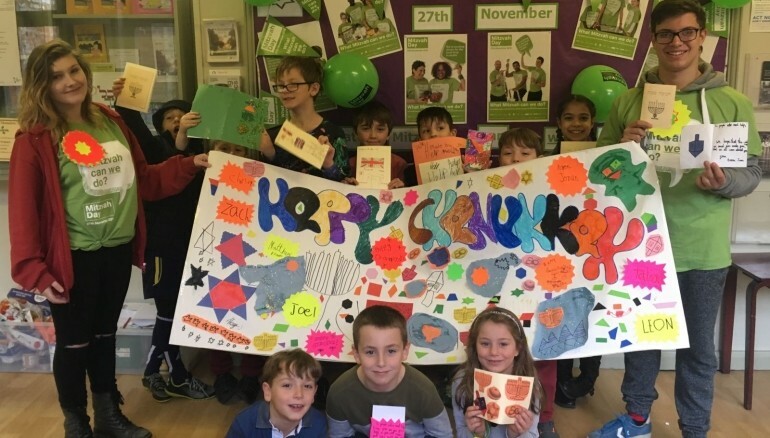 The children of ALEH live in residential homes, where they receive medical treatment, go to school and attend social activities.With your help, we can make our children feel more at home – Create a collage, a painting or make Chanukah cards for the children of ALEH. Be creative and express your artistic side, for the benefit of the children of ALEH. We promise to deliver your piece to them and use it to decorate their home. We can arrange a visit from ALEH’s very own Liron to run a session perfect for a Cheder. Liron will run a session which explores what it is like to live with learning difficulties and how we can improve the lives of those affected. As there is only one Liron, if you are interested in hosting Liron, it may be necessary to schedule for days following Mitzvah Day itself. Get Hands on in Israel! And if you are in Israel and looking for a hands on project to support then there are opportunities to help in one of our centres. Last year ALEH was lucky enough to receive a visit from a group of students from FZY, the oldest Zionist youth movement in the UK, who were spending their gap year in Israel. These wonderful young adults spent the afternoon running activities for our amazing ALEH residents and making them smile from ear to ear. We would love to be able to run this type of project again in Israel this year.